For the third straight game, the Jazz started strong before fading in the second half of a lopsided loss. This time it was a 124-111 defeat at the hands of the Toronto Raptors Monday night in Salt Lake City. The loss was Utah's fourth in a row. "I thought we came out of the gate with a lot of good energy," Jazz head coach Quin Snyder said. "We made mistakes on defense and got down, and I think when you're passive collectively, not communicating with each other, that results in breakdowns." 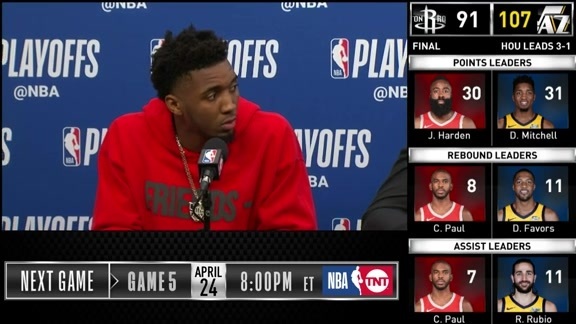 Each team played without its leading scorer—Utah's Donovan Mitchell (22.4 ppg) and Toronto's Kawhi Leonard (26.1 ppg) both sat out with ankle injuries. 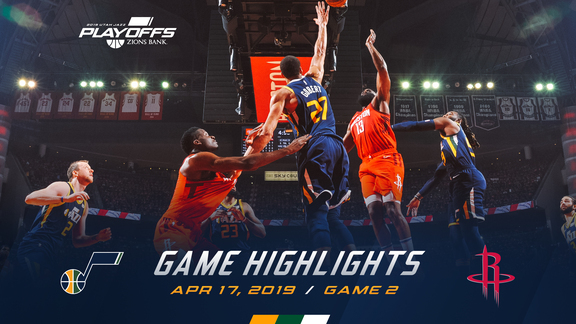 Alec Burks led the Jazz (4-6) with 22 points off the bench, while Rudy Gobert (14 points, 12 rebounds, two assists, one steal, one block) and Derrick Favors (11 points, 10 rebounds, three steals, two blocks) each finished with a double-double. Jae Crowder (12 points) and Royce O'Neale (11 points) also scored in double figures in the loss. Four Toronto players—Kyle Lowry, Serge Ibaka, Fred VanVleet and OG Anunoby—finished with 17 points each. Ibaka, who fouled out after just 14 minutes of court time, shot a perfect 8-for-8 from the field just one day after scoring 34 points on 15-for-16 shooting against the Lakers. Pascal Siakam added 16 points and seven rebounds for the Raptors (10-1), who are tied with the Warriors for the best record in the NBA. After missing the past four games with a wrist injury, Burks provided Utah's only steady source of offense against the Raptors. He shot 7-for-10 from the field (including 2-for-3 from beyond the arc) and 6-for-6 from the line while adding three assists and a block in 27 minutes. The Jazz had two strong stretches in the first half. Right of the bat, they jumped out to a 14-5 lead thanks to a series of buckets at the rim, plus a 3-pointer by Joe Ingles. Favors tipped in a miss, while O'Neale slashed in for two layups and a dunk to get Utah's offense rolling early. A 13-5 run early in the second quarter turned a one-point deficit into a seven-point lead. Danté Exum scored on a layup, and then Gobert completed a three-point play. Burks scored five points—on a three-point play of his own plus a dunk—and O'Neale capped the run with a layup. And ... that's when the wheels came off. Toronto closed the first half on a 30-12 run and then opened the second half on a 12-3 run to take a 20-point lead less than three minutes into the third quarter. The Jazz outscored the Raptors 39-30 in the fourth quarter (which included nine points by rookie Grayson Allen) but the game was all but over by that point. The Jazz are now 0-4 at home, marking the first time in franchise history the team has dropped its first four games in Salt Lake City. The Jazz shot only 11.8 percent (2-for-17) from 3-point range through the first three quarters. Ingles shot 2-for-4, while Crowder (0-for-6) and Ricky Rubio (0-for-3) failed to connect from deep. "Our general effort needs to be better. We need each other. When you don't shoot well, you need to be even more committed to the defensive end. We can't rely on making shots in order to play defense." Ingles dislocated his finger midway through the fourth quarter and did not return to the game. ... The Jazz shot 40.6 percent from the field in the first three quarters. ... After several animated discussions with the referees, Lowry was (finally) called for a technical foul in the third quarter. ... Utah shot 27-for-41 (65.9 percent) from the free-throw line. The Jazz will remain home to host the Dallas Mavericks on Wednesday night. Tipoff is set for 7pm MT.